, a learned Fleming, was the son of Adolphus, counsellor of state to the emperor Charles V. and born at Bruges in 1536. 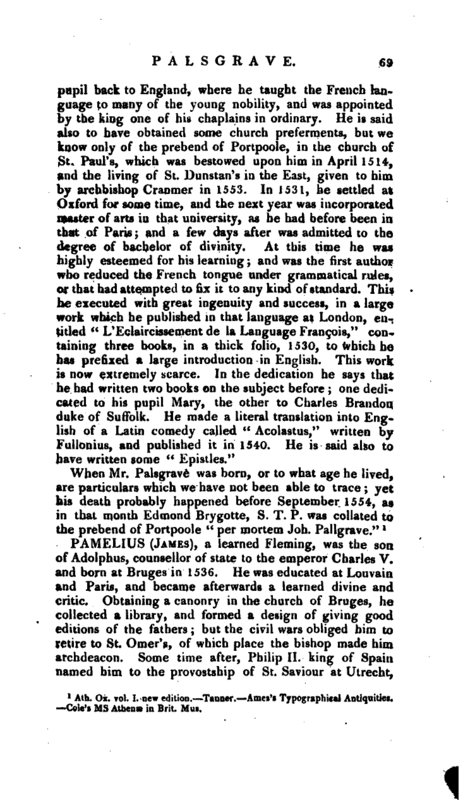 He was educated at Louvain and Paris, and became afterwards a learned divine and critic. Obtaining a canonry in the church of Bruges, he collected a library, and formed a design of giving good editions of the fathers; but the civil wars obliged him to retire to St. Omer’s, of which place the bishop made him archdeacon. Some time after, Philip II. king of Spain named him to the provostship of St. Saviour at Utrecht, | and after that to the bishopric of St. Omer’s: but, as he went to Brussels to take possession of it, he died at Mons in Huinault, in 1587. He is chiefly known for his critical labours upon “Tertullian and Cyprian;” of both which writers he published editions, and prefixed lives. 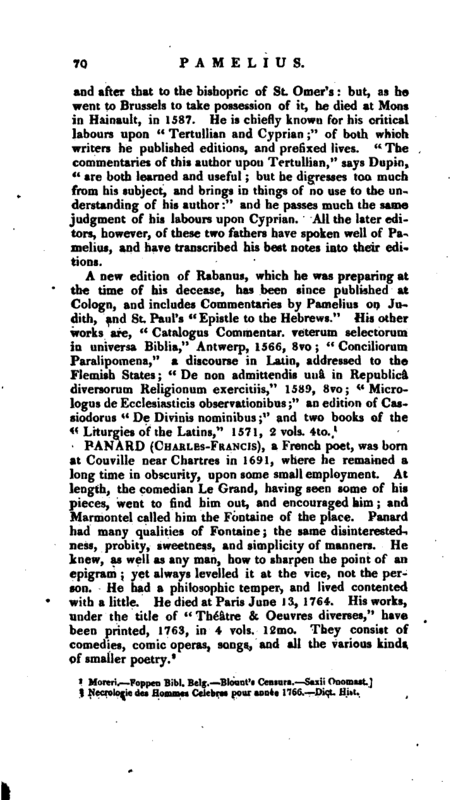 “The commentaries of this author upon Tertullian,” says Dupin, “are both learned and useful but he digresses too much from his subject, and brings in things of no use to the understanding of his author:” and he passes much the same judgment of his labours upon Cyprian. All the later editors, however, of these two fathers have spoken well of Pamelius, and have transcribed his best notes into their editions. Moreri. —Foppen Bibl. Belg. Blount’s Censura. —Saxii Onomast.